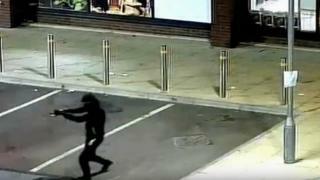 A man who aimed a sawn-off shotgun at a police officer has been jailed for six years. Michael Scott, of Rose Avenue, Wigan, aged 27, pointed the loaded weapon when he was confronted in Partington, Greater Manchester. It was a "stark reminder of the dangers" officers face, said police. Minshull Street Crown Court heard how police were alerted to a "disturbance" on Moss Lane in the early hours of 30 June 2018. When officers arrived, they were confronted by Scott, who aimed the shotgun at one of the officers. The gunman was able to escape by jumping over fences while being chased by the officer and several police cars. He was later arrested on wasteland near Derwent Close by armed police. While on the run, Scott discarded some of his clothing and also attempted to hide the weapon. It was later found on the roof of an electric substation on Manchester Road by detectives. Det Sgt John Seaton said: "Thankfully no-one was injured at the hands of Scott but the damage he could have easily caused with a fully loaded weapon doesn't bear thinking about." Scott was ordered to serve an extended licence period of two years on his release from prison.